San Luis Obispo County, CA â€“ Event organizers for Sunset SAVOR the Central Coast prepare to move forward with plans for 2014. The growth in attendance and economic impact for SAVOR and overall awareness the event campaign creates for local tourism reaffirms the eventâ€™s ongoing success, according to officials for Visit San Luis Obispo County and Sunset Magazine, the authority on western living. Now ranked among the nationâ€™s top food and wine events, Visit San Luis Obispo County Board of Directors and Sunset Magazine unanimously voted to proceed with the fifth annual event to be held September 25-28, 2014 in San Luis Obispo County. Throughout the 2013 event weekend, more than 10,500 guests attended Sunset SAVOR the Central Coast, held September 26-29, 2013, reflecting a 5.8% increase in attendance over 2012. The event attracted food and wine lovers from across California and from 33 states and Canada seeking adventure with the annual themed event Time to Play. Revenues from the four-day event boosted the local economy by $4.54 million, a 27.2%increase over 2012. Beyond SAVOR, San Luis Obispo County continues to garner national recognition: Paso Robles was named â€œWine Region of the Yearâ€ by Wine Enthusiast Magazine and Lonely Planet ranked the Central Coast among the top 10 travel destinations in the U.S. in 2014.
â€œThe promotional value of SAVOR and these national accolades are key in positioning San Luis Obispo County as a premiere destination for wine, food, adventure and coastal fun,â€ said Jacob. Planning for SAVOR 2014 is actively underway. The line-up will focus on the Main Event at Santa Margarita Ranch and include adventure tours, special dinners and VIP events throughout the county. The four-day event is designed to provide attendees a customized and unique experience. More than 36% of attendees participate in more than one SAVOR activity and 2014â€™s Time to Play will continue to showcase the unique aspects of San Luis Obispo County. Economic Impact Analysis for Sunset SAVOR the Central Coast 2013 prepared by Ken Riener and Patrick Mayeda, Productive Impact LLC San Luis Obispo. Visit San Luis Obispo County promotes San Luis Obispo County through advertising, marketing, public relations and group sales. Its membership base is comprised of over 500 tourism industry-Â­-relatedbusinesses including lodging properties, restaurants, wineries, golf courses and retail stores. Sunset SAVOR the Central Coast is produced and managed by the organization. For more information on Visit San Luis Obispo County, please visit www.visitsanluisobispocounty.com. Sunset magazine was founded in 1898 and has become the premier guide to life in the West, covering the newest and best ideas in Western home design and garden, food and entertaining, and regional travel in 13 Western states. 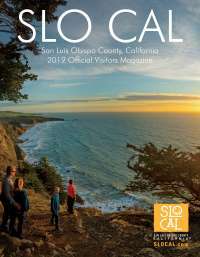 It is published in five zoned monthly editionsâ€”Pacific Northwest, Northern California, Southern California, Southwest and Mountainâ€” showcasing the regionâ€™s unique lifestyle and noteworthy destinations and inspiring its nearly five million readers to achieve the dream of living in the West. The magazine is also available on all tablets. Sunset is part of the Lifestyle group of magazines and websites published by Time Inc.